ALABAMAWORKS! UPDATE NEWSLETTER - FEBRUARY 2017 - AlabamaWorks! 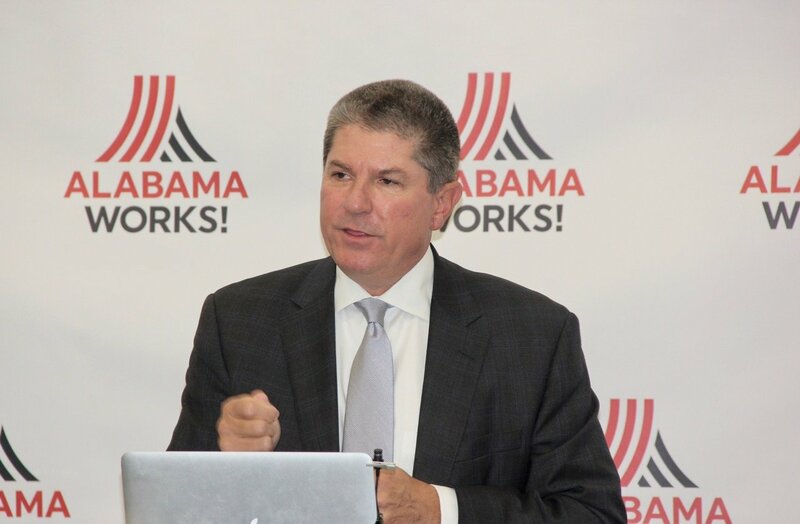 The purpose of AlabamaWorks and the Alabama Workforce Council is to develop a trained and willing workforce and connect that workforce with Alabama industries needing capable workers. To meet that lofty goal, we must use every option in our toolbox – education, job training, job placement and partnership with industry. One tool that merges many of those options is paid apprenticeships. In this month’s newsletter, we highlight a brand new apprenticeship program that will help meet the workforce needs of businesses across the state as well as Alabamians seeking a promising career. We will also look at a years-old regional apprenticeship program that grew out of a partnership among industry, community colleges and AIDT and is already working to meet the needs of industry and job seekers. Gov. 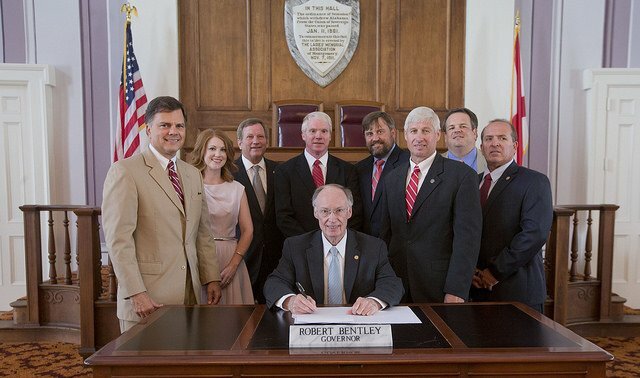 Robert Bentley signs bill creating Alabama Apprenticeship bill. The bill was sponsored by Sen. Arthur Orr and Rep. Alan Baker. In January, the Alabama Department of Commerce officially launched Apprenticeship Alabama, a program that invests in both workers and industry. The program offers tax credits to companies that hire qualified apprentices who receive classroom or industry-specific instruction and on-the-job training. 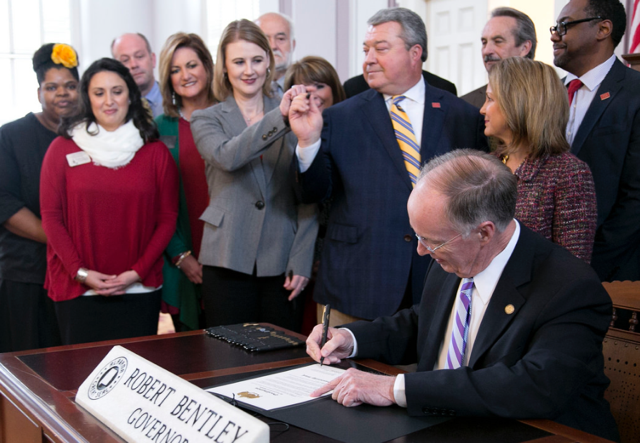 The groundwork for Apprenticeship Alabama was laid last spring when the Alabama Legislature passed Senate Bill 90, sponsored by Sen. Arthur Orr, R-Decatur, creating the state’s Apprenticeship Tax Credit. 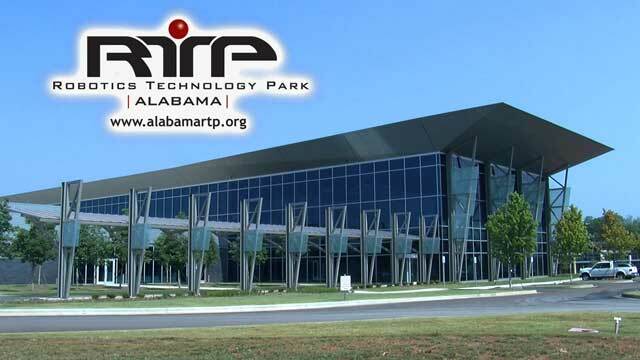 Orr worked with Ed Castile, deputy secretary of the Alabama Department of Commerce and director of AIDT, to research state apprenticeship programs and draft a plan for Alabama. Last fall, Gov. Robert Bentley signed a proclamation declaring Nov. 14-20 as Apprenticeship Week in Alabama. Secretary of Commerce Greg Canfield, center, AIDT Director Ed Castile and Apprenticeship Alabama Manager Frank Chestnut were among those on hand for Gov. Bentley’s signing of the proclamation designating Nov. 14-20 as Apprenticeship Week. Under Apprenticeship Alabama, qualified companies can receive an income tax credit of $1,000 per year per apprentice. A company can receive a tax credit for up to five apprentices. To participate, companies must register with the U.S. Department of Labor’s Office of Apprenticeship and meet its classroom and on-the-job training requirements. Alabama’s two-year colleges will play a key role in the classroom training area. Frank Chestnut, who manages Apprenticeship Alabama, said the Department of Commerce is at work looking to grow the program and increase the number of participating businesses and applicants. To find out more about the benefits and requirements of Apprenticeship Alabama and how to register for the program, contact Chestnut at fchestnut@aidt.edu. Please check out this story about Apprenticeship Alabama on the Alabama Department of Commerce’s website. A program marking Apprenticeship Week was held in November at shipbuilder Austal’s facility in Mobile. Austal employs more than 4,000 people in Mobile. Southern Union grads Billy Ashe and Deanna Kendrick went on to work for Baxter International. While Apprenticeship Alabama may be new, educators and workforce development professionals have partnered with industry at the local level for years to provide apprenticeship opportunities that meet the needs of employers and career-minded workers. Before the East Alabama Industrial Consortium was created in 2012, industries in the Auburn-Opelika area were having trouble filling positions in their maintenance departments because not enough applicants possessed the technical skills needed in these technology-driving facilities. Through the consortium, member companies agreed to begin a collaborative apprenticeship program to educate and train a labor pool with the highly technical skills to meet the companies’ needs. Southern Union Community College not only serves as the consortium’s education and training partner, but also assumed the role of coordinating the apprenticeship program as its sponsor through the U.S. Department of Labor’s Office of Apprenticeship. Among the industry partners are Baxter International, Briggs and Stratton, Kemmerich Metal Engineering, Weidplas, Pharmavite, RAPA, GE Aviation, CSP Technologies, Donaldson, Donghee Alabama, Mando America and Rexnord Industries. Baxter, a healthcare giant, was a leader in the formation of the East Alabama Industrial Consortium, and in 2014 announced a $300 million expansion of its state-of-the art manufacturing facility in Opelika. That expansion created a need for an additional 200 skilled workers. Southern Union partnered with AIDT to help train workers. 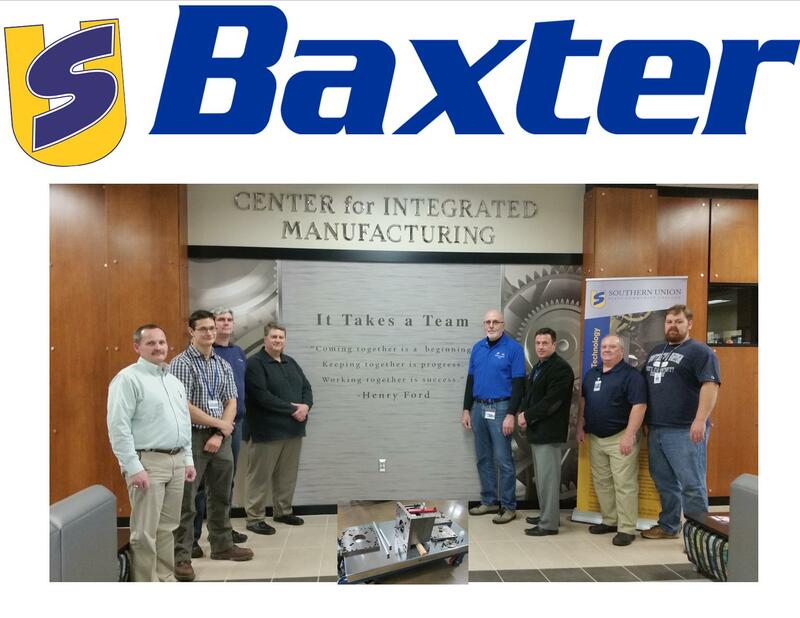 Baxter engineers, Southern Union faculty and AIDT designed a simulated manufacturing cell with donated equipment to assist with the training. The partnership with Baxter led to the creation of the Center for Integrated Manufacturing on Southern Union’s Opelika campus. An offshoot of that was the decision by Arburg, the leading supplier of injection molding machines in the U.S., to bring its Southeastern Training Center to the Center for Integrated Manufacturing and use it as the base for customer training for the Southeast. Check out this 2014 article “The Modern Apprentice” in Business Alabama magazine about collaborative industry apprenticeship programs and their partnerships with Alabama Community Colleges. Many key leaders, including economic development, education and business professionals, are aware that a significant transformation of how the state manages the Workforce Innovation and Opportunity Act (WIOA) is under way. At the direction of the governor, the WIOA State Board and the Alabama Workforce Council, the Alabama Department of Commerce Workforce Development division is transitioning the current three-local-area-board structure to a seven-local-area- board structure. The current three boards are Jefferson County, Mobile County and the balance of state known as the 65-county Local Board. The purpose for the transition is to ensure funding decisions are made locally and those decisions are to be based on workforce data and company needs. For that reason, Mobile and Jefferson will have additional counties added and their respective boards will expand. Five new local boards are being developed that will now make local funding decisions in their respective areas. The seven boards match the designated Regional Workforce Councils. To be compliant with the WIOA, the chief local elected official in every county must agree with the changes and sign an agreement to make the change. That work is in progress. Within the Department of Commerce, an implementation team has been developed and several team members are working on various parts of the transition, including meeting with the county officials and developing training for all staff and Career Center staff for the various changes and new roles that must be in place for the new plan to succeed. A timeline was established with assignments, and the team is working the plan. More than half the counties have had the WIOA transition plan introduced to them with scheduled meetings on the calendar to meet with the balance of county officials. The transition plan introductions have been made by Secretary of Labor Fitzgerald Washington, WIOA State Board Chairman George Clark and Deputy Secretary of Commerce Ed Castile. Our plan is to have the introductions completed by the end of January, agreements signed by mid-March and new boards identified and appointed by April 30. Staff in the Jefferson and Mobile expanded local areas are currently going back to each county with the agreements for signature as many of the commissions have or are about to act favorably on our request. The Department of Commerce implementation team will follow up with the five new local areas’ counties. There is much to be done, but the good news is the transition is under way and moving very expeditiously. County leadership across the state is excited about the changes. In addition, our Department of Labor federal regional administrator in Atlanta and his staff are assisting our team at every step. The regional administrator is in full support of the changes and agrees with our goal of decisions being made locally as the WIOA intends. The Alabama Workforce Council received an update in January on the branding of the state’s workforce system. 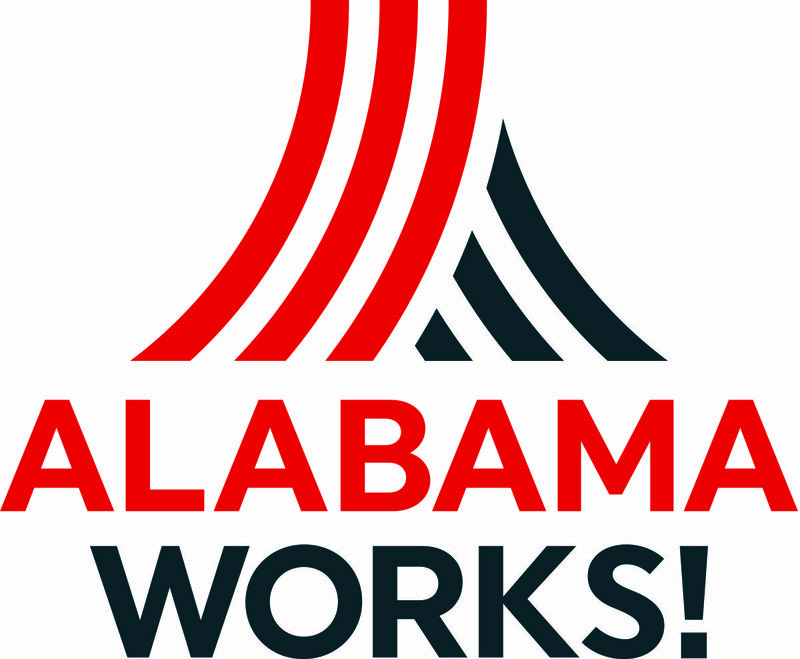 You will recall that the new brand, AlabamaWorks, along with the new logo were unveiled in November in events in Montgomery and Bessemer. The update, presented by IDEAS Media & Experience Design, covered the brand reveal events and the wide media attention they attracted. 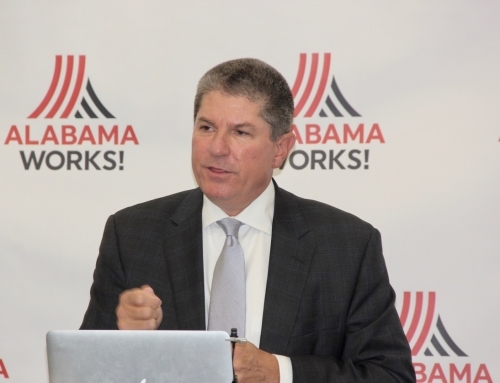 Also discussed was the development of the new AlabamaWorks.com website, which grew from 6,123 page views on the brand reveal day in November to more than 11,000 on Jan. 6. In addition to the statewide AlabamaWorks website, each of the Regional Workforce Councils is developing its own AlabamaWorks-branded website. A training session was held in January to help the Regional Councils and directors, as well as others who are playing key roles as the face of the workforce system, “enculturate” the new brand into their websites and operations. In addition to the Regional Councils, other groups represented were K-12 career coaches, Alabama Community College System, Alabama Technology Network (ATN), Alabama Career Centers and AIDT liaisons to the regions. The update also included a report on the AlabamaWorks Update Newsletter, which has grown to more than 6,300 recipients. This newsletter will continue to be e-published on a monthly basis. Please continue to encourage friends, colleagues and anyone interested in keeping abreast of workforce development news in Alabama to sign up for the newsletter. You can refer the newsletter to a friend at the link below. They can also sign up at AlabamaWorks.com. The strong partnership between Bevill State Community College and Alabama Power Co. continues to grow. That partnership began in 2010 when the Southern Company started using Bevill State instructors to provide safety and health training to Alabama Power hydro facilities and generating plants. It expanded to include Bevill State providing classroom and office space on its Sumiton campus to offer technical instruction to workforce in the area; the development of a computer and soft-skills course catalog to meet the needs of employees in Alabama Power’s “In-Plant Career Development Program”; a partnership among Alabama Power, the International Brotherhood of Electrical Workers and Bevill to update electrical and mechanical apprenticeship training programs; and the creation of the Alabama Power Company Technical Education Center on Bevill’s Sumiton Campus. The Technical Education Center provides technological support for apprenticeship and journeyman training for Alabama Power’s Miller and Gorgas plants. It also helps prepare students with more marketable career skills while enhancing Bevill’s workforce development education program. Gov. Robert Bentley tours the Alabama Power Company Technical Education Center at the Bevill State Community College campus in Sumiton. Read about the 2015 dedication of the Alabama Power Company Technical Education Center, which included Alabama Senate Majority Leader Greg Reed of Jasper as well as Alabama Power, Bevill and IBEW officials. Also, this video shows Gov. 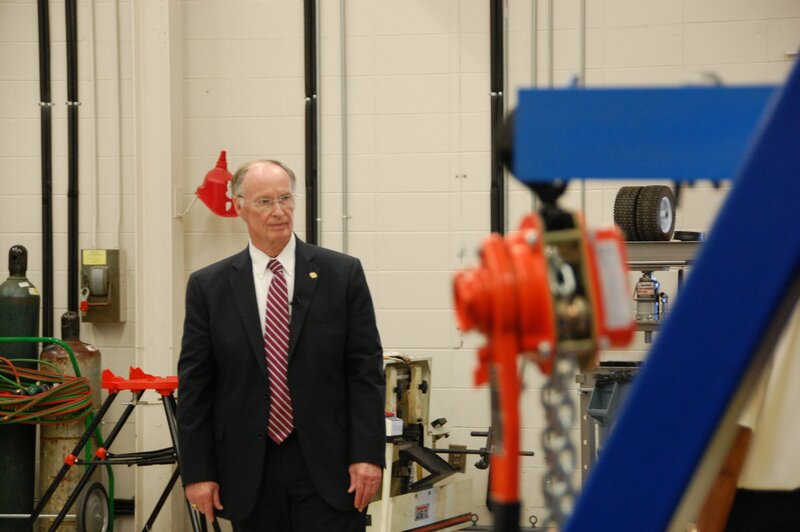 Robert Bentley’s tour of the Technical Education Center in November with Sen. Reed and other leaders. Trenholm State Community College and the Alabama Technology Network (ATN) collaborated to provide an array of technical and professional services for To Your Health Sprouted Flour Company. To Your Health is a family-owned and operated small business in a farm setting in rural Alabama. It offers freshly milled flours from organic sprouted grains. The sprouting, drying and milling process is all done in its facilities in Fitzpatrick. To Your Health mills each order fresh to provide its customers the best sprouted flour possible. Its customer list includes Whole Foods Markets, Arrowhead Mills, the Hain-Celestial Group, Anita’s Organic Milling (Canada), LaBree’s Bakery and Kellogg. In January 2016, ATN began working with To Your Health on an Enterprise Resource Planning Assessment. From that assessment, ATN became the project manager overseeing the installation of To Your Health’s high definition security cameras, VOIP, fiber optics and wireless Internet needs. 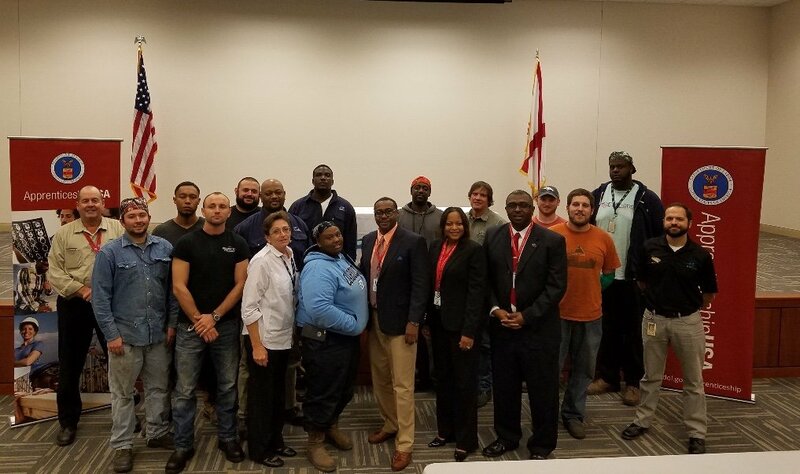 With this ongoing work, Trenholm State Community College has provided HACCP/food safety, CPR, OSHA 10, forklift driving and job readiness training, and worked with ATN to facilitate Lean 101, Total Productive Maintenance, 5S of Workplace Organization and Kaizen Events training. To Your Health continues to grow with the project management and training provided by ATN and Trenholm State. The nursing program at the “new” Coastal Alabama Community College (created by the merger of Faulkner, Alabama Southern and Jeff Davis community colleges) was recently ranked the best in Alabama by RegisteredNursing.org. Nursing programs were assessed on several factors that represent how well a program supports students toward licensure and beyond. RegisteredNursing.Org analyzed past and present National Council Licensure Examination “pass-rates,” weighted by year. The NCLEX is the standardized exam that each state board of nursing uses to determine whether or not a candidate is prepared for entry-level nursing practice. “With the goal to give the best education that money can buy, Coastal State Community College, located in Bay Minette, Alabama, is prepared to help RN’s meet the challenges of nursing through a variety of study options,” RegisteredNursing.org said. To see the ranking of nursing programs in Alabama, click here. As part of the Alabama Department of Labor’s ongoing marketing plan, a public service announcement was produced with Raycom Media and a video digital ad was produced by the Alabama Media Group. These ads are helping spread the word about what ADOL does. One of those featured in the ad is Capt. Josh Henderson of the Alabama National Guard, who was interviewed by Alabama Media Group’s videographer and shared his positive experiences attending ADOL’s regional job fairs. Others interviewed included employers and job seekers who have had successful experiences at ADOL job fairs and career centers. The interviews took place at the Montgomery Career Center. There are also a 30-second ad and a 60-second ad. Speaking of job fairs, one that received widespread media coverage was the highly successful Montgomery Regional Job Fair held Nov. 30. ADOL partnered with the City of Montgomery and WSFA/Channel 12 News on the job fair, which was held at the Cramton Bowl Multiplex. More than 3,100 job seekers attended, and more than 1,800 jobs were available, ranging from health care, to administrative to manufacturing. Read some of WSFA News coverage of the jobs fair. As we previously reported, more than 4,300 eighth-graders and approximately 2,000 ninth- through 12th-graders got a hands-on look at high-paying jobs in West Alabama at Worlds of Work career expo held Oct. 13 and 14 at Shelton State Community College’s Martin Campus in Tuscaloosa. Designed to showcase a range of technical and high-wage careers in sectors such as energy and utilities, manufacturing, automotive and logistics, transportation, hospitality and tourism, engineering, environment, public safety and tourism, the expo welcomed students from nine counties to participate in interactive exhibits from local employers looking for highly skilled workers. One high school student in attendance at the event was awarded a semester’s tuition to either Shelton State Community College or Bevill State Community College, in the form of a one-time, nonrenewable scholarship (worth 12 credit hours) through a random drawing of the high school participants. The winner, Carlie Wisdom, a senior at Sipsey Valley High School, elected to use the scholarship at Shelton State. Worlds of Work is a project of West AlabamaWorks, the Region 3 Workforce Development Council and the Chamber of Commerce of West Alabama. For more information, visit www.worldsofwork.com. If you are interested in donating money toward a scholarship for a WOW participant, please call 205-391-0331. 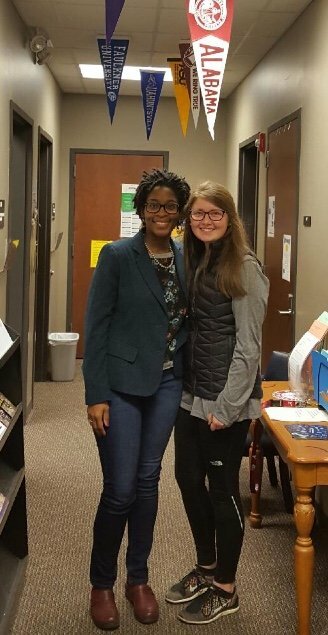 Scholarship winner Carlie Wisdom, right, and Sipsey Valley High Counselor Brandi Shanklin. 800 Students Attend Next Step Career Expo in Covington County.